This horse portrait is on view in the exhibition ‘ The Horse ‘ in the National Gallery of Victoria, Melbourne (until 9 November 2015, see the page Temporary Exhibits on this website). It is part of a series of horse portraits in the same style in the museum collection. In the 1760s the Mughal rulers of Rajasthan (India) had the tradition of representing leaders on impressive horses which were heavily decorated. This horse has painted pasterns and fetlocks, which was customary in this tradition. The manes have been heavily braided with colored straps. Similar straps are hanging from the saddle and have been used for the crupper and the tassel on the horse’s front. The bridle is provided with a standing martingale, so this is not a 20th century invention. The rider has a hunting crop in his left hand. The type of horse is unknown. The ears point towards each other which is a characteristic of the present-day breed in Kathiawar and Marwar, also in Rajasthan. This horse is now rare and may be a remnant of those bred there in the 18th century. 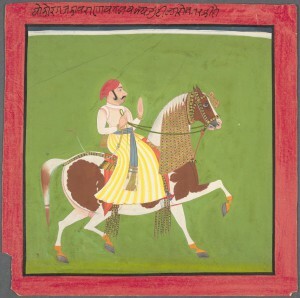 The Rajasthan horses may well have been influenced by imports from Turkmenistan. There is also a legend that the Kathiawar and Marwar horses were influenced by a group of Arabian horses that shipwrecked on the west coast of India.